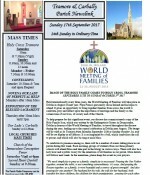 To help prepare for this significant event, our diocese has commissioned a copy of the Holy Family Icon, which was written by the Redemptorist Sisters in Drumcondra, Dublin in honour of the World Meeting of Families, to travel throughout the diocese during the year, leading up to the central celebration in Dublin next August. The image will be with us in Tramore from Monday September 25th to Sunday October 1st, and will be on display at all Masses. It is accompanied by a bell, which symbolises the call to prayer, and which will also be rung at each Mass. To celebrate its presence among us, there will be a number of events taking place in our parish during that week. Each morning, groups of students from our three primary schools will attend Mass and take part in the liturgy in various ways. 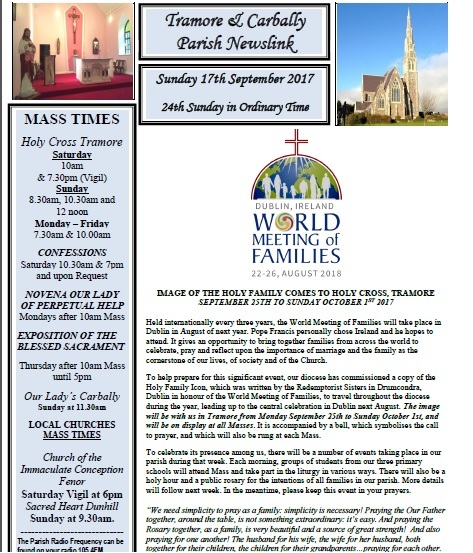 There will also be a holy hour and a public rosary for the intentions of all families in our parish. More details will follow next week. In the meantime, please keep this event in your prayers.